You don't need a time machine to to experience the heyday of 1970s Hollywood — just look to the Rosy Oyster, the pop-up wine and oyster bar at the famed Hollywood Roosevelt Hotel in Los Angeles. Bright yellow and gold intertwine with pink and blue against a moody backdrop, creating a scene that's not only stylish, it's simply cinematic. The dramatic results were intentional: the design team leaned into the locale's historic status as a celebrity mainstay for inspiration, and set out to create a space worthy of the storied clientele. 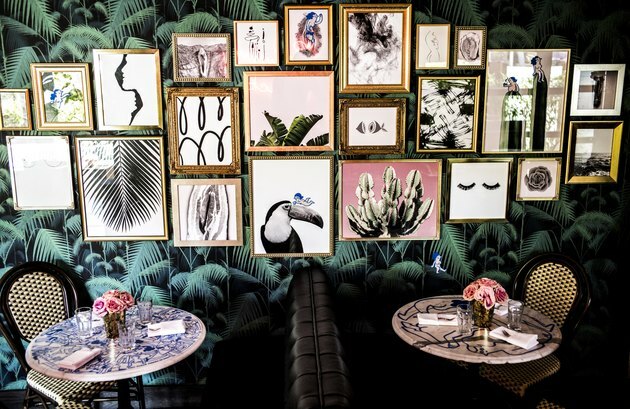 Striking palm tree wallpaper acts as the defining feature of the space, which plays off the gold frames of a large gallery wall and classic bistro chairs with equal pops of personality. Those seats surround intimate tables topped with bold graffiti-like prints, and offset the more communal meeting area of a mod butter-leather couch. Brass fixtures, numerous potted palms, and rows of glassware complete the look, making for a dining room that feels blissfully indulgent. Whether you're center stage or part of the audience, take note: graphic prints and confident shades look especially stunning when used with abandon. 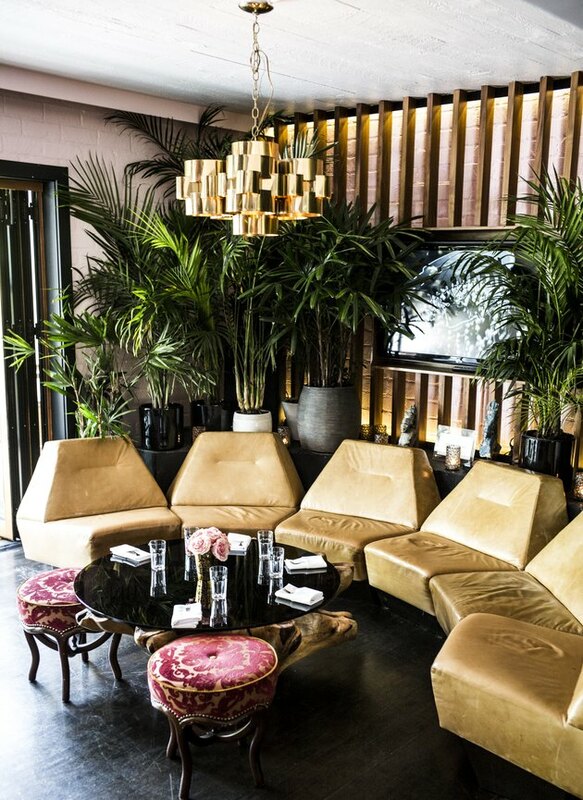 The gallery wall plays nicely against the throwback palm wallpaper, as dark leather banquettes add a retro air to the seating arrangement. A set of bistro chairs bring the right amount of romance to the high-impact palm wallpaper. 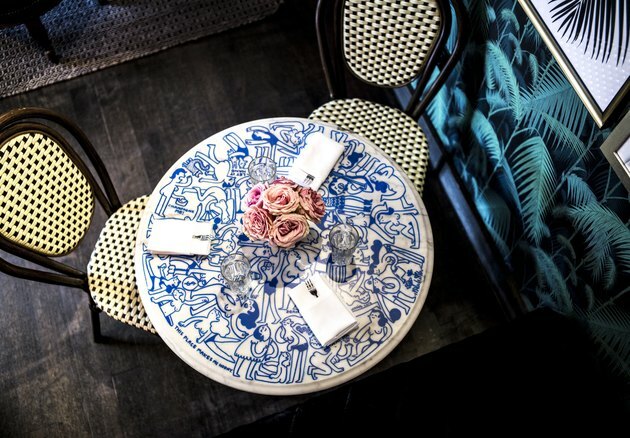 The tabletops, walls, menus, and other hidden spots feature cheeky cartoon illustrations by artist Amit Greenberg. 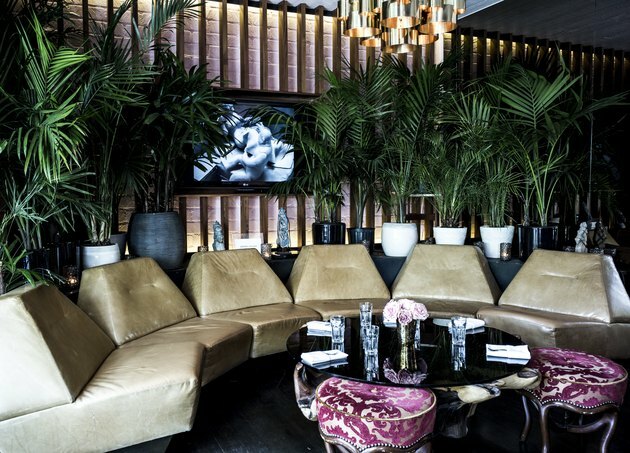 The layout's design maximizes seating without sacrificing intimacy, since oysters are a communal affair. This half-circle sectional has room for party, and it matches the gold light fixture overhead. Grouping leafy palm trees in neutral pots makes for a textured and unconventional wall backdrop. Additional toile-covered stools create extra seating around a low table. 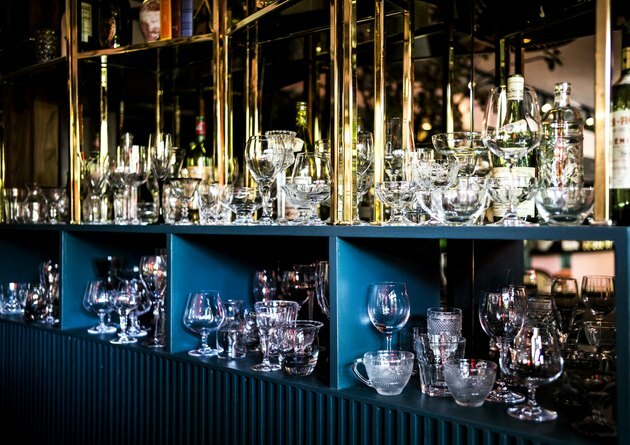 The restaurant's glassware — which is perfect for rosé — lives in bright blue cabinets that match other facets of the space's design, like Greenberg's illustrations.